GMC introduced the world this week to the 2020 Sierra Heavy Duty, a truck that can "pull like a pro" and see right "through the trailer." 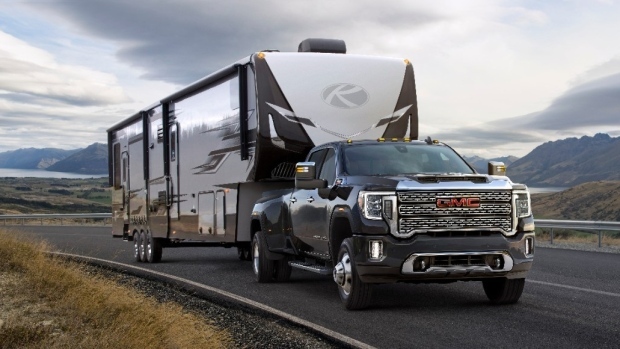 While GMC's 2020 Sierra Heavy Duty truck is definitely the heartiest of the line, the pickup also features a slew of advanced technological innovations right down to a transparent trailer view. Because "trailering is the most important consideration for Sierra Heavy Duty customers," the company ensured that this model was tailored for those who heave and haul. The truck is equipped standard with the enhanced ProGrade Trailering system first seen in the 2019 Sierra Light Duty pickup, a system which now features 15 camera views including a "transparent trailer view." This technology works in the same fashion that we've seen in systems made for semi-trucks, like Valeo's "XtraVue Trailer," allowing drivers to more easily see what's behind their freight thanks to a strategically placed camera mounted on the rear of the trailer. GMC is also offering an optional smart trailer designed to work with the iN-Command control system by ASA Electronics which can be managed via the myGMC app. This application works together with an in-vehicle Trailering App to help drivers monitor everything about their hauls from the temperature to the tire pressure. Additionally, MultiPro, a six-function tailgate, was designed to make loading, unloading, and accessing the bed easier than before. An enlarged cabin brings more space to all occupants, especially those in the front row, and the driver is provided with a handful of new tech in the cockpit including a heads-up display and GMC's newest touchscreen infotainment system. The Duramax 6.6L turbo-diesel engine complete with a new cooling system provides 445 horsepower and 910 lb-ft of torque and is combined with a new 10-speed Allison automatic transmission designed to haul bigger loads than ever possible in the line. As for the body, compared to the previous generation of the truck, the wheelbase is longer, the height is taller, and the grille is larger. In short, "the bigger frame, stronger propulsion and smarter technologies are expected to deliver dramatically greater towing capacity than previous models, well in excess of 30,000 pounds." The 2020 Sierra Heavy Duty will be available later this year in 2500HD and 3500HD dual rear wheel and single rear wheel configurations. Pricing will be announced closer to the release date.